Albert Einstein predicted gravitational waves as part of his theory of general relativity more than 100 years ago, but it has taken astrophysicists more than 50 years of trial and error to find the direct evidence to support his theory. The Laser Interferometer Gravitational-wave Observatory (LIGO) made the detection January 4, 2017. Gravitational waves pass through Earth and the extremely sensitive LIGO detectors can “hear” them. This third and latest detection points to merging black holes that are twice as far away from Earth as the two earlier pairs—about 3 billion light-years away. And this time the two black holes were unequal in size, one significantly lighter than the other. They merged into a black hole whose size is in the middle of the other two merged black hole pairs. “Our handful of detections so far is revealing an intriguing black hole population we did not know existed until now,” says Vicky Kalogera, a senior astrophysicist with the LIGO Scientific Collaboration (LSC), which conducts research related to the twin LIGO detectors, located in the US. She is also director of Northwestern University’s astrophysics center, CIERA, and professor of physics and astronomy. “Once again, the black holes are heavy,” says Shane L. Larson, researcher associate professor of physics and astronomy at Northwestern and an astronomer at the Adler Planetarium in Chicago. The third detection is the subject of a new paper accepted for publication by the journal Physical Review Letters . The latest finding solidifies the case for a new class of black hole pairs, or binary black holes, with masses that are larger than researchers believed possible before LIGO. “As was the case with the first two detections, the waves detected in our new paper were generated when two black holes merged to form a larger black hole. In the latest merger, the final black hole was some 50 times the mass of our Sun,” explains coauthor Ling Sun, a PhD student at the University of Melbourne’s School of Physics and member of the Australian Research Council Centre of Excellence for Gravitational Wave (OzGrav). 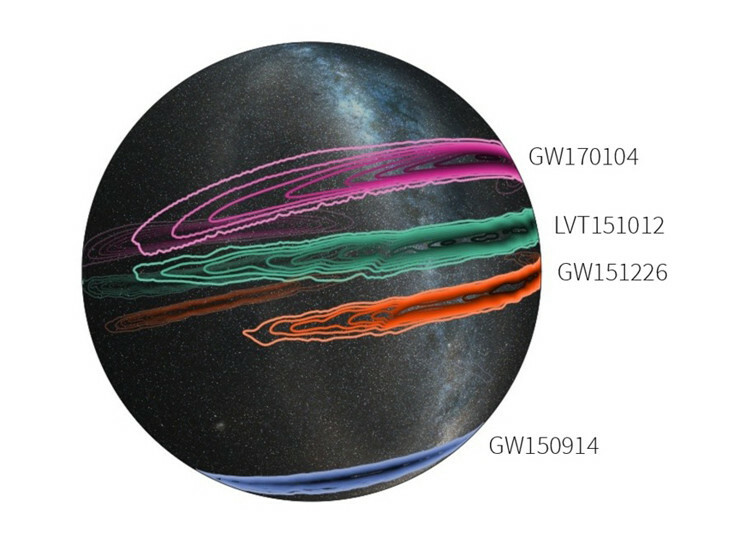 The new detection, called GW170104, occurred during LIGO’s current observing run, which began November 30, 2016, and will continue through the summer. Twin detectors, one in Hanford, Washington, and the other in Livingston, Louisiana, carry out LIGO’s observations. In all three cases, each of the twin detectors of LIGO detected gravitational waves from the tremendously energetic mergers of black hole pairs—collisions that produce more power during the instant before the black holes merge than is radiated as light by all the stars and galaxies in the universe at any given time. There are two primary models to explain how binary pairs of black holes can be formed. In one model, the black holes come together later in life within crowded stellar clusters. The black holes pair up after they sink to the center of a star cluster. In this scenario, the black holes can spin in any direction relative to their orbital motion. “This is the first time that we have evidence that the black holes may not be aligned, giving us just a tiny hint that binary black holes may form in dense stellar clusters,” comments B. P. Sathyaprakash, professor of physics and of astronomy and astrophysics at Penn State and co-leader of the paper. The other model proposes that the black holes are born in the same binary system: they form when each star in a pair of stars explodes, and then, because the original stars were spinning in alignment, the black holes remain mostly aligned, even if not perfectly aligned. GW170104 hints that at least one of the two black-hole spins might be misaligned with the binary orbit, mildly favoring the formation theory of dense stellar clusters. The LIGO Laboratory receives funding from the National Science Foundation (NSF) and is operated by Caltech and MIT, which conceived and built the observatory. The NSF led in financial support for the Advanced LIGO project, with funding organizations in Germany (MPG), the UK (STFC), and Australia (ARC) making significant commitments to the project. More than 1,000 scientists and engineers from around the world participate in the effort through the LIGO Scientific Collaboration, which includes the GEO Collaboration. LIGO partners with the Virgo Collaboration, which has the support of the Centre National de la Recherche Scientifique (CNRS), Istituto Nazionale di Fisica Nucleare (INFN), and Nikhef, as well as Virgo’s host institution, the European Gravitational Observatory, a consortium that includes 280 additional scientists throughout Europe. A list of additional partners is available here .